These pizza cupcakes are super easy to make! 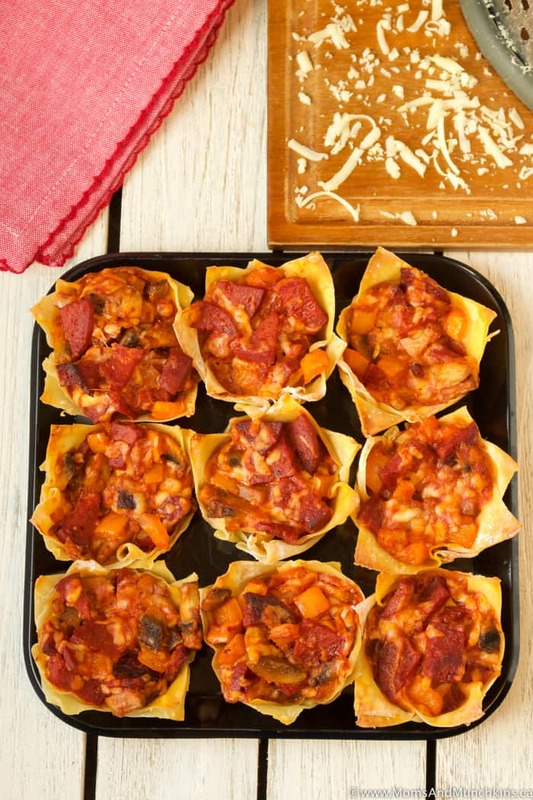 Load them up with your favorite pizza toppings and bake them in wonton wrappers. Super easy, right? 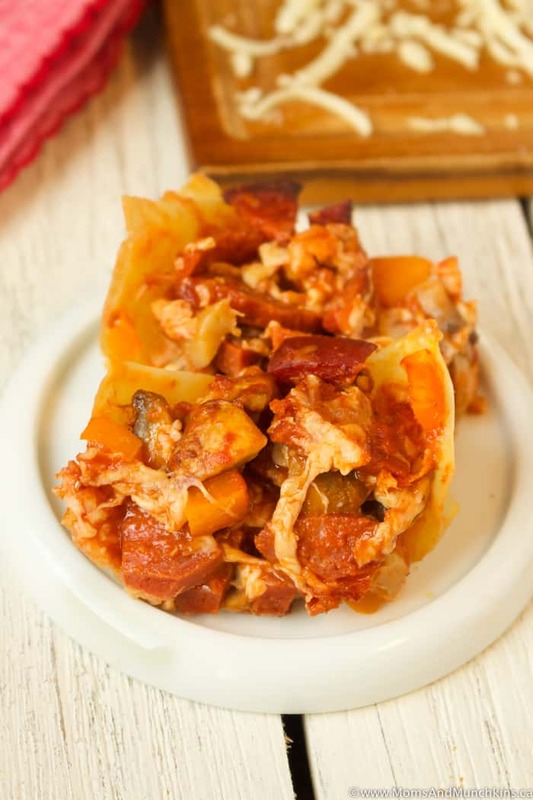 This recipe would make a great game day appetizer. I’m not much into sports (unless it’s watching my son play sports – nothing cuter than a bunch of little kids playing hockey) but I’d respond a big YES to a game day party invitation because I know those parties always have the best food! Is it wrong to go to a party just for the food? Nope! I’d be lying if I said I didn’t head straight to the dessert table upon arrival to almost any party. Cake, cookies, cupcakes…don’t mind if I do! I included a few of my favorite pizza toppings in this recipe but if you don’t like chorizo, mushrooms, etc. feel free to swap with your favorites like ham, pineapple, onions, etc. 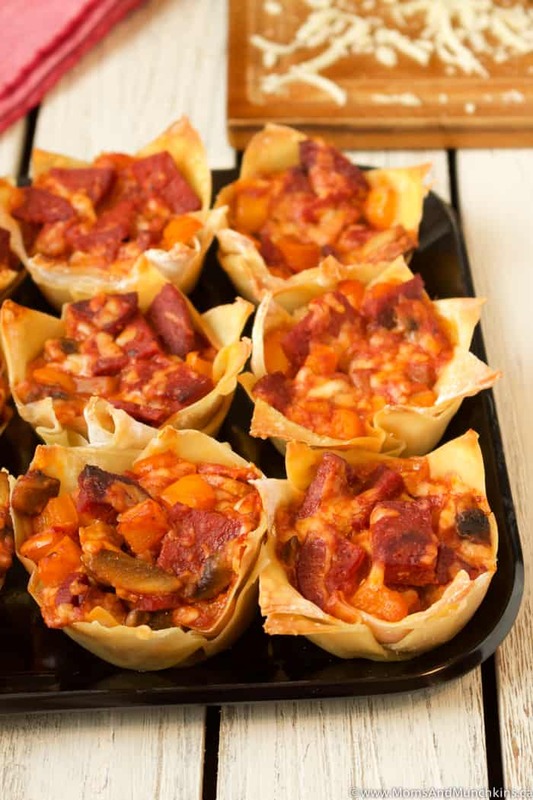 This recipe makes 18 pizza cupcakes. Spray 18 muffin tins with non-stick cooking spray. Overlap two wonton wrappers in each muffin tin. In a small frying pan, cook mushrooms and bell peppers until slightly softened. In a large bowl, combine meat, mozzarella, bell pepper, mushrooms and pizza sauce. Stir to mix well. 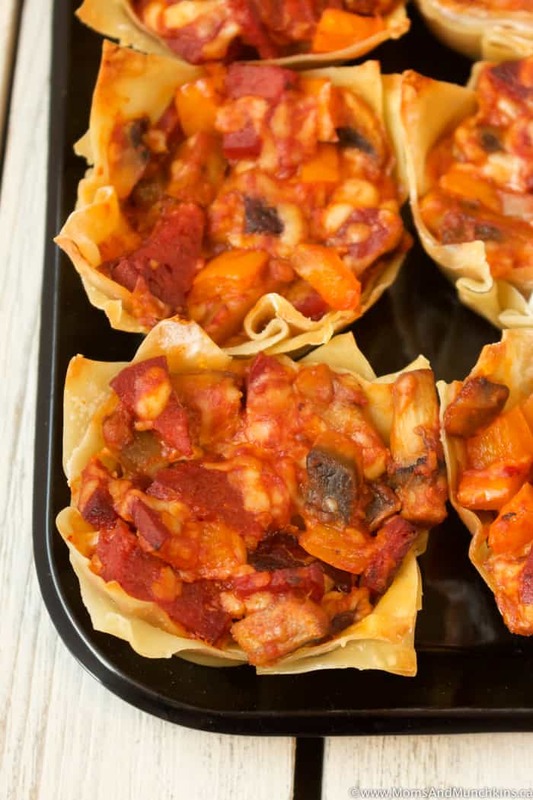 Fill each unbaked wonton shell with pizza mixture. Bake for 13-15 minutes until wontons are slightly crispy and filling is hot (melted cheese). Love pizza? Check out some of our other pizza recipes! 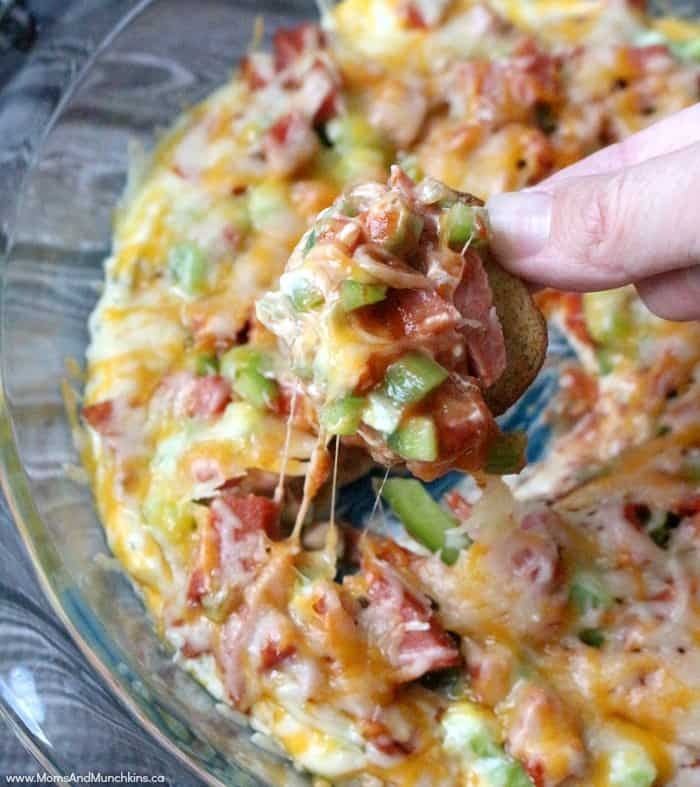 Layered Pizza Dip – super easy to make and a hit with all ages. 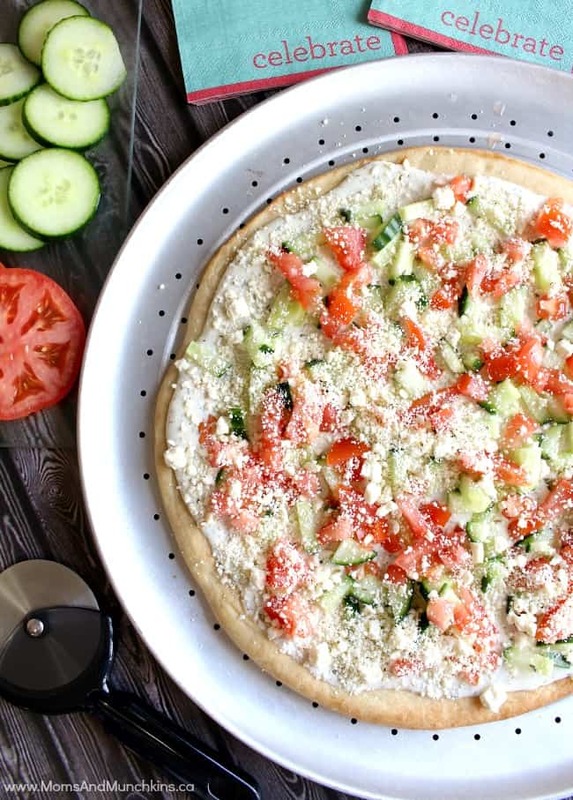 Greek Pizza – a cold appetizer pizza topped with fresh vegetables. Find even more delicious ideas on our Recipes page. Stay updated on the latest home entertaining ideas by following us on Instagram, Pinterest, Facebook and Twitter.